Valkyria Chronicles 4 made me feel like I was playing the first installment of the series all over again, which, in case you’re wondering, is most definitely a compliment. The franchise had lost its way in recent years, so it’s kind of nice to know that Sega decided to throw its legion of fans back onto the battlefield with more strategy-oriented combat. It’s a challenging, rewarding, and sometimes goofy experience, one that will surely delight those who stuck by the series. That said, it does have its problems, but overall, VC4 delivers the sort of thrills (and frustration) that will give longtime enthusiasts a reason to assemble the troops and venture once again into war-torn Europa. The story pretty much hits the ground running as First Lieutenant Claude Wallace (who sports one of the most unfortunate names in JRPG history) completes a short mission with Squad E, which features — you guessed it — a handful of his childhood buddies. It’s kind of like Starship Troopers, except without the giant bugs or Denise Richards. The opening moments give you a pretty good grasp of what’s happening: There’s a huge war taking place across Europa in 1935, which stems from the Empire’s desire to obtain an energy source called ragnite. To do so, they slowly begin taking over land controlled by the Federation, a loosely connected democracy that doesn’t intend to stand idly by while these fascist dictators seize everything they hold dear. Neither one plans to back down anytime soon. I’m usually not the sort of person who enjoys military-style games, even when there’s a heavy RPG slant (with, of course, the exception of the first Valkyria Chronicles). That said, Valkyria Chronicles 4, while very much a military-minded strategy game, smartly sets aside time away from the horror and sadness of war to allow its stable of likable characters to enjoy some much-needed levity. Sure, having some of the guys discuss masturbation, female backsides, and various other sophomoric topics might seem out of place in such a dark story, but I looked forward to these light-hearted moments. 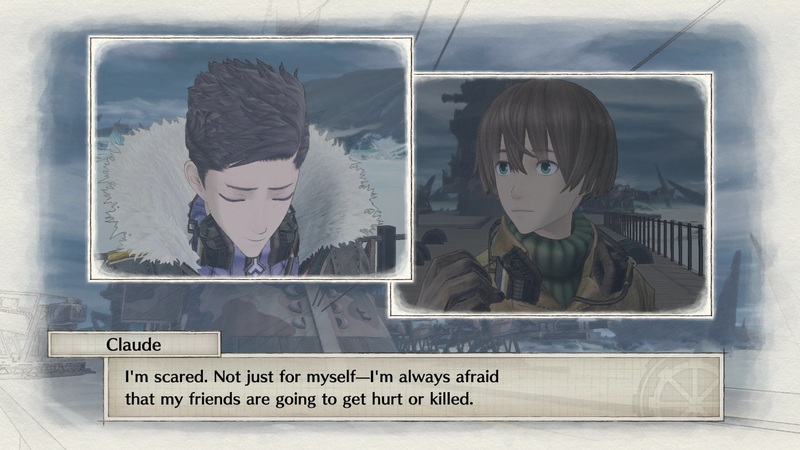 Even in a game with as much style and color as VC 4, the threat of war isn’t something that settles well with me, so giving players a break from the drama keeps the story breezy without sacrificing emotion. 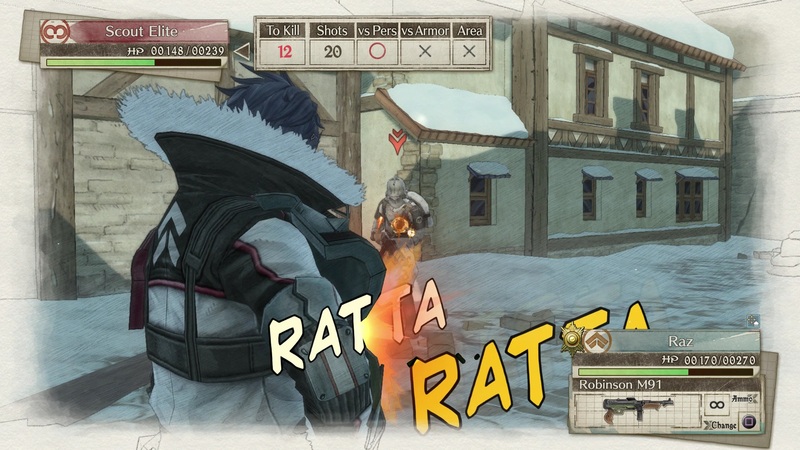 Oftentimes, Valkyria Chronicles 4 feels like a cross between a board game, a third-person JRPG, and a visual novel. That sounds like a lot of hats on one head, for sure, but somehow these work well together, though each has its troubles. Perhaps my biggest complaint comes from the amount of time you spend reading conversations between the characters, many of whom don’t have anything remotely interesting to say. Sure, poor Claude heads up Squad E, but he’s easily the most spineless and grating member of the group. Even after he supposedly gets his head in the game and stops letting people walk all over him, he’s constantly apologizing to people who don’t deserve it. His buddy Raz, for example, treats him like dirt on more than one occasion, and he’s also quick to use the dreaded “Scaredy-Claude” insult whenever Wallace wants to retreat from the battlefield. In other words, Claude bugs me as a hero; I never feel like he’s confident enough to lead anything. That said, there are some great moments between the characters, though the game would have benefited if someone had trimmed the fat. Love them or hate them, at least Squad E and the Federation have personality. With one or two exceptions, the evil and wicked Empire definitely lacks noteworthy characters, and the foes you face in conflict are completely interchangeable with one another. If you’ve seen one scout, shocktrooper, or lancer at the wrong end of your weapon, you’ve seen them all. In a game that doesn’t shy away from delving into the horrors of war and the emotional toll it takes on soldiers, having the enemies appear as faceless cannon fodder cheapens the experience somewhat. Even a randomly generated name associated with the engineer you’re trying to snipe would have added some weight when you’re finally in a position to pull the trigger. As it stands, you’re just shooting vanilla targets that won’t hesitate to fire back. The hollowness of the foes aside, Valkyria Chronicles 4’s combat feels exactly like the first Valkyria Chronicles, minus a few classes and mechanics. After deploying your unit, you’ll switch between a 2D overworld map and a third-person view that allows you to command your squad as you barrel toward your mission objective. You only have so many moves during your phase of the battle, which can be used to move infantry, give specific commands, or call for back-up, so it’s important to develop a strategy if you have any hope of surviving some of the game’s surprisingly difficult showdowns. 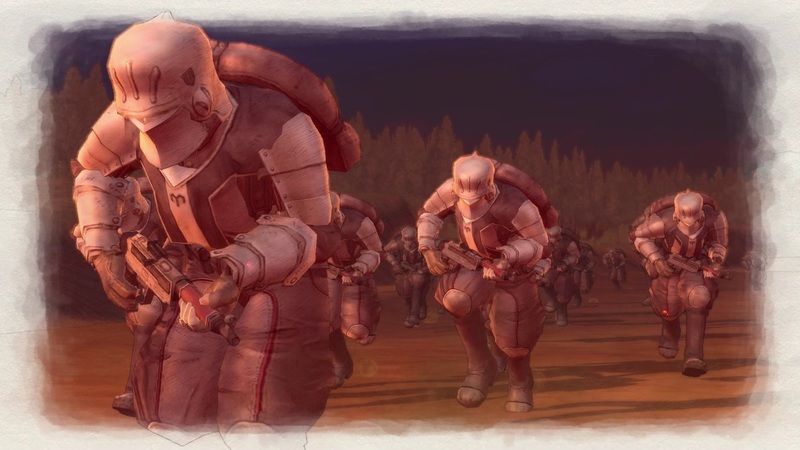 Don’t get lulled into thinking that the opening missions are indicative of the quests you’ll face later in the game; VC 4 eases you into the mechanics of war before throwing you into large-scale skirmishes that require careful planning and good management of resources. If you plan incorrectly or squander your assets, then you’ll find yourself starting all over again. And unless you enjoy keeping things realistic, I’d recommended saving often. If you lose one of your favorite characters on the battlefield (minus those required for the story), they’re over and out. Watching naive little Nico bite the dust still haunts me to this day, I’m afraid. Thankfully, you have some tools at your disposal that will help you navigate the game’s more difficult battles. As you progress through the story (and the optional skirmishes), you gain experience points and cold, hard cash, which will help level up your squadron and give them better weaponry and armor, as well as boosting the power and defenses of your precious tank, Hafen. However, instead of boosting individual characters, the game takes a “one size fits all” approach to growth; when you level up a specific class, those benefits spread across all the characters who fall under that banner. There’s no need to upgrade your favorite sniper when everyone in that class gets a nice little boost when you put them through the rigors of field training. The same goes for weaponry; when you upgrade one weapon, anyone carrying it will get the bonuses. Although it cuts down on how you grow and shape individual characters, it doesn’t hurt nearly as bad if you, say, lose your favorite sniper because you stupidly wandered in front of a lancer with perfect aim. 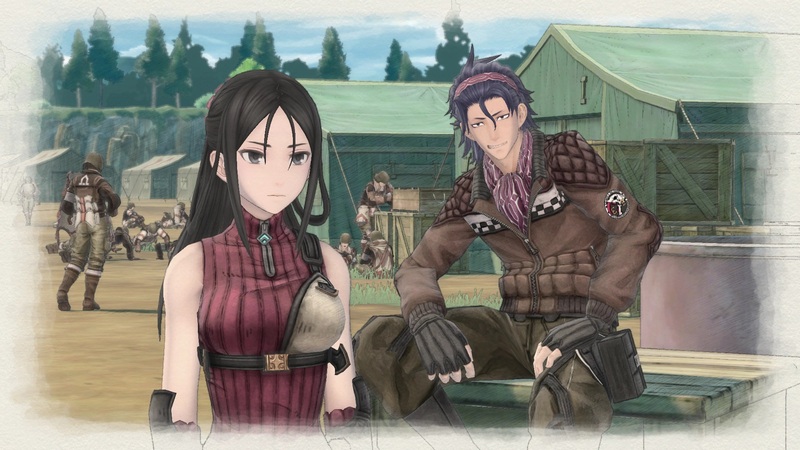 Like me, there’s a fair chance you’ll develop an emotional attachment to more than one of these goofy characters over the course of Valkyria Chronicles 4. Some of them are a little obnoxious (I never liked Raz, despite the game’s many attempts to make him a lovable rapscallion), while others sink their claws into your soul and hold on for dear life. For instance, I used Jester, Rosetta, and Jean during almost every operation simply because I grew to like their quirks, ticks, and shortcomings. Even when their so-called “potential” (essentially the game’s version of buffs and debuffs, which trigger randomly) threatened to derail the mission, I wanted to bring them along for the ride. The same rings true for Jimmy, a “boy next door” lancer who couldn’t hit the broad side of a barn. I lost count of the many times I cursed his name under my breath as his shot sailed way beyond the target I’d ordered him to take out. For a while, Jimmy was my jam, but as the battles became more taxing, I had to put him on the bench. Amusement will only take you so far, and I ultimately needed a reliable lancer. Sorry, Jimmy. There are plenty of moments to get to know these dedicated soldiers, though a lot of them are purely optional. Some of their tales appear as optional episodes in Claude’s diary, while others show up as Squad Stories, complete with their own missions — some of which are surprisingly difficult. If you’re only interested in the campaign and couldn’t care less about the characters, their backstories, and what-not, you can skip over these parts without losing anything in the process. That said, VC 4 is very character-driven, which means you benefit a lot from the dialogue between the people under your command. These side stories and quests might seem a little long-winded and, at times, pointless, but they help flesh out some of the characters, even those that seem wholly one-dimensional. Learning that one of my favorite characters once joined the church surprised me, especially since he didn’t have a problem taking down countless foes in combat. Unraveling his story made me appreciate his struggles, and I found myself taking better care of him whenever I needed him to get his hands dirty. What makes all this stuff work is the art style. Valkyria Chronicles 4 looks like a watercolor painting come to life, which often makes the widespread death and destruction a little easier to swallow. Although some of the cities you fight through can look a little drab, there are moments in the game when the art is truly beautiful. What’s more, the characters are wonderfully realized, and each one has a unique look. The same doesn’t ring true for the Empire, save for a few, but I’m glad the characters you spend the most time with have been painstakingly brought to life. Of course, it still looks like an anime, but the decision to once again add an eye-catching watercolor veneer sets it apart from other strategy-minded JRPGs. Even when my frequent incompetence on the battlefield destroyed my ability to remain calm and collected under pressure, I still enjoyed taking in my surroundings. In short: It’s a very good-looking game. Unfortunately, Valkyria Chronicles 4 hits retail shelves alongside some high-profile releases, including Dragon Quest XI and Spider-Man. 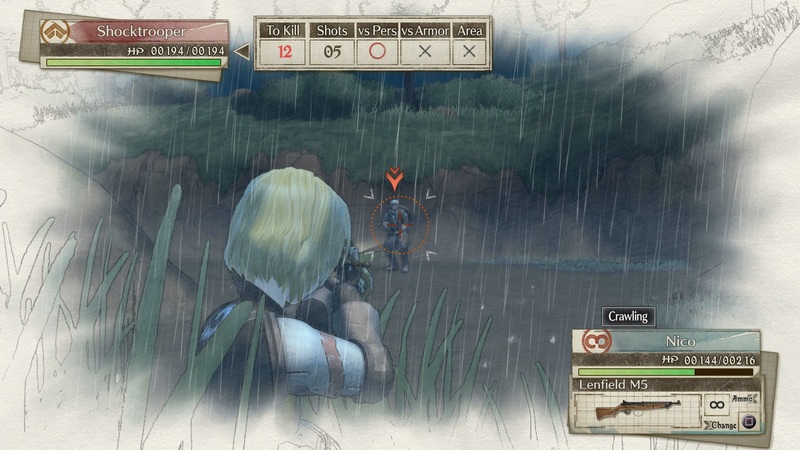 Which is a shame, really, as VC 4 takes some light strategy, familiar JRPG tropes, and a charming presentation and rolls them into a satisfying experience that’s both challenging and easy to play. The story, while dark and surprisingly deep, doesn’t always take itself too seriously, though it builds up enough emotion for you to care if a member of your squadron falls in battle. Although the strategy elements aren’t overwhelmingly deep and trying to navigate the battlefield can result in your character getting stuck in a narrow pathway (spending precious action points in the process), there are very few bumps in this particular road. As long as you don’t mind reading mountains of text as you get to know the people under your command, Valkyria Chronicles 4 should enthrall fans who longed for the franchise to return to its strategy-based roots. This review is based on the PlayStation 4 version of the game. A review copy was provided to us by Sega.